The State of Missouri is requesting applications from schools and school fleet operators to replace old diesel buses. This funding opportunity is open to public and private schools and school districts and for-profit operators of school bus fleets, providing up to $22,000 for each vehicle replaced. The Missouri Department of Natural Resources, which administers the program, anticipates 70-75 bus replacements statewide through this one-year cycle. The deadline for districts and school transportation providers to apply is Friday, September 14th. Applicants may apply for funding for up to 3 buses if replacing diesel with diesel; however, they can apply for funding for up to 10 buses if replacing diesel vehicles with propane, compressed natural gas (CNG), all-electric buses, or other clean-fuel alternatives. Shuttle buses, paratransit or any school vehicles not powered by diesel are not eligible. This funding cannot be used to expand a fleet, and only buses powered by engine model years 1995 – 2006 are eligible. Replacement buses cannot exceed 125% of the original buses’ GVWR, and a minimum GVWR of 14,000 pounds is required. Applicants must be able to fund the entire program up front, since it is based on reimbursement from Missouri DNR. Federal funds cannot be used to provide the required 75% match for this program, nor can other funding from the VW Trust. There are other details and restrictions that apply to this program – please read all information carefully before applying! 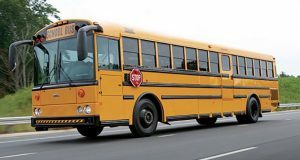 Request For Applications For Early Replacements Of School Buses contains detailed information on program requirements and timelines. For guidelines and a link to updates on opportunities for other vehicle categories, including heavy trucks, cargo moving and electric vehicle charging systems, we recommend Volkswagen Trust – Apply For Funding. For specific questions about program requirements, please contact Mark Leath at the Department of Natural Resources, and as point of contact for application submission. Get $3000 off on a 2018 Nissan LEAF MEC is Looking for a Fall ’18/Spring ’19 paid intern!